The most common musculoskeletal injuries in athletes are ankle sprains. Over 90% of these are inversion injuries causing partial or complete rupture of the anterior talofibular ligament and the calcaneofibular ligament. The rehabilitation of an ankle injury can be challenging for the practitioner. 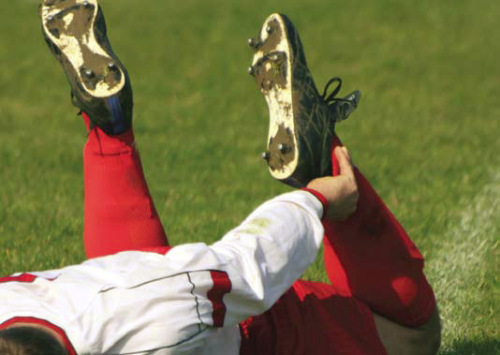 In this blog we look at the research available on the rehabilitation of complex ankle injuries. Ankle sprains are the most common musculoskeletal injuries in athletes. Studies show that 90–95% of ankle sprains are inversion injuries causing partial or complete rupture of the anterior talofibular ligament (ATFL) and occasionally the calcaneofibular ligament. The rehabilitation of an ankle injury can be challenging and awkward for the practitioner, depending on the complexity of the injury and the necessity and pressure to return an athlete back to their level of performance. As ankle injuries in sport are so common, a solid diagnosis and a rehabilitation programme are essential. does not exceed the physiological range of the ankle joint. This blog looks at the research surrounding the rehabilitation of proprioception and strength in lateral complex ankle injuries, and gives the author’s own experiences in the practical treatment and rehabilitation of such injuries. The time taken for the athlete to return to play is dependent on the structures involved and the severity of the injury. The ATFL is the smallest (20mm long, 10mm wide and 2mm thick) and the weakest of the lateral ligaments (fig 2.). It is frequently damaged during inversion injuries with the foot in the plantar-flexed position, when the ligament is placed on full stretch and does not have the safety of the ankle mortice to protect the joint. 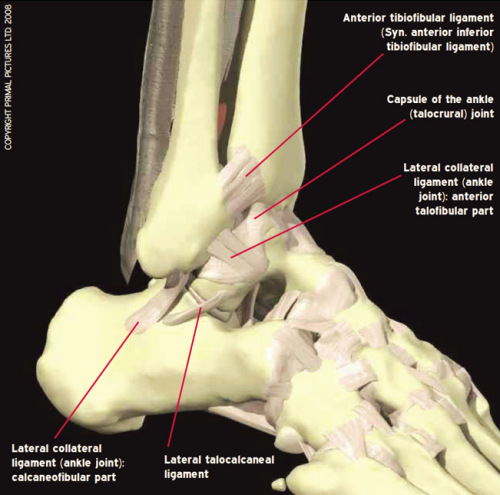 The ATFL and posterior talofibular ligaments (PTFL) are blended with the ankle joint capsule. In severe injury resulting in large ankle oedema, ATFL⁄PTFL and capsular tearing must be suspected. Stabilising effect on the subtalar joint rather than the ankle joint itself. It does not blend with the ankle joint capsule. Fibrous, flattened band that extends obliquely downwards and laterally from the tibia on to the anterior medial aspect of the distal fibula. It is often known as the sling⁄base to the syndesmosis of the tibia and fibula complex. This ligament can be identified by a dial⁄screw test: the examiner cups the calcaneus with one hand while placing the other hand on the anterior aspect of the tibia with the knee bent to 90°. By fixing the tibia and externally rotating the calcaneus, and indeed the ankle complex, a stress is applied, causing diastasis of the mortice. If injury to this ligament is suspected, then pain and apprehension will prevail. The cervical and interosseous ligaments around the lateral aspect of the subtalar joint are often forgotten in ankle injuries. These two ligaments control the amount of rear foot eversion⁄inversion of the subtalar joint. Classically, in severe inversion injuries, the subtalar complex can also be damaged. The use of orthotic cups to prevent unwanted stretching to these ligaments, and thus to restrict over-pronation, has been of benefit in the early to mid stages of rehabilitation. The key to any successful rehabilitation programme is understanding the mechanism of injury, the correct diagnosis, and the grade and severity of the injury. The initial 72 hours is vital, as the reduction of oedema around the ankle joint allows better early function, which has been shown to return an athlete back to fitness more quickly. Compression is far more important than ice. It is important to maintain compression at all times, especially within the first 48 hours. Leaving on a compression garment and introducing ice immersion while letting the compression drip-dry is of far more benefit than applying ice alone. The use of intermittent compression garments such as flowtron or newer products such as game readytm, which allow ice to be applied using various pressures through a compressive sleeve, are of great benefit, especially as longer treatment times can occur without the hazard of an ice burn. Myers and colleagues injected the lateral ligament complex of patients who were blindfolded and tested on a 30° inversion drop-down door at a speed of 440 second. They found no difference in the reaction times of tibialis anterior and peroneal brevis and longus between the placebo group (saline) and the tested group (lidocaine). However, compared with the control group, both injected groups (lidocaine and saline) experience suppressed muscle activity during perturbation tests and dynamic activity (walking). The authors concluded that any oedema within the joint causes a reduction in dynamic stability. Once the swelling has subsided, the next step is to gain range of movement, passively and actively. Weight-bearing is advocated as early as possible, whether assisted or not, depending on the severity and tolerance of the patient. It is important at this stage not to overload the injured ligament and joint. Protection via bracing and taping is vital. “Little and often” is a good guide in the early stages when dealing with weight-bearing and exercises to increase range. This allows for the patient and the therapist to establish the diagnosis and the tolerance of the injury to load. Dorsiflexion is often the range that is most difficult to regain following an ankle injury, but it is also the most important in terms of function. Often full active dorsiflexion is not gained before other strength and functional activities are undertaken. This can be a mistake, as the talus is not functioning correctly through the ankle mortice, thus placing unwanted stress on the subtalar joint and surrounding joints and tissues. Emphasis on accessory as well as physiological dorsiflexion is paramount in order to reduce unwanted complications, which can occur at a later stage in the rehabilitation programme. Often these complications occur higher up the anatomical chain, such as at the knee or hip, as the body adapts to a restriction in the ankle. Large population studies have shown the effect of intensive proprioception training programmes on reducing the incidence of reinjuring an injured ankle. Other studies using large populations have combined the use of proprioception with other rehabilitation interventions, such as bracing, taping and strength work, and have shown good outcomes. Clearly proprioception has a place, but the understanding of the different aspects of proprioception is important in order to allow the therapist to appreciate that it is not just about placing the person on a wobble board. Many authors have defined proprioception as the afferent input of joint position sense – the awareness of position or movement. Others, however, look at it in a broader sense that includes neuromuscular control. Activity of a joint and muscle, whether conscious or subconscious, is a combination of multi-site sensory input, which is received, processed and distributed in order to cause effect by an intricate working relationship of the brain and spinal cord (receiving) and the central nervous system. This article concentrates on the somatosensory subsystem. The contribution to proprioception from the skin receptors is minimal. A much greater contribution comes from the joint and muscle spindle receptors. Mechanoreceptors, which are situated within the ankle joint capsule, ligaments and bones, act as range-limiting inhibitors and potentially stop the joint from moving through excessive ranges by signalling the presence of noxious intense stimuli. quick-adapting adaptors, while the regulation of joint position sense is thought to be related to the slow-adapting receptors. Hence, proprioceptive rehabilitation must include movement stimuli and joint position sense. The muscle receptors provide an almost complementary neural contribution alongside the mechanoreceptors. The predominance of slow activity receptors within the skeletal muscle responds to length changes and, in harmony with the articular mechanoreceptors, can feed information to the CNS when the joint and muscle are moving, accelerating or decelerating; they also identify the ankle’s position in space. – joint position sense – being able to reposition the ankle without the aid of visual input. Proprioception exercises should start as soon as possible in order to re-educate the damaged receptors associated with the ligament injury. Any pain, swelling and reactive inflammatory markers need to be observed to ensure that the introduction of proprioception exercises, especially weight-bearing exercises, does not cause a reactive synovitis, which can delay healing. From the understanding of the subsystems involved in proprioception, it is important that all three levels of motor control are included in the rehabilitation programme. End-range joint-positioning activities should be undertaken repeatedly to stimulate the higher brain centres and thus to create a learning response. The ability to move from conscious to unconscious motor programming is vital for the athlete to perform at the highest level without the consequence of re-injuring the ankle complex. Initially the athlete will concentrate on the proprioception task in order to facilitate and maximise sensory input. With progress, the activities incorporate cognitive aspects, which aid in converting conscious joint stabilisation and control to unconscious motor programming. classically a good way to enhance the late stages of this part of proprioceptive stimuli and should always incorporate activities from the athlete’s sport, such as swinging a racquet or kicking a ball. The ability to introduce and duplicate speed with balance, relating to the individual’s sport, is vital in order to achieve this higher unconscious learning response. To stimulate the spinal level of motor control, activities that create sudden movement are needed to promote unconscious reflex joint stabilisation. Plyometric and jump- and catch-based activities encourage joint muscle activity and address the neuromuscular activity at the spinal level. These exercises should be incorporated towards the end of the rehabilitation programme in order to protect the healing tissue. Muscle stimulation is also encouraged in the early stages, as long as joint reaction and thus joint oedema are minimal. This is undertaken in non-weight bearing exercises simply by asking the athlete to respond to stimulation via the therapist’s hands (perturbation) and asking the athlete to stop any sudden movement in any direction. Muscle activity. Peroneal reaction time is significantly shorter in stable compared with unstable ankles, and emphasis on the peroneal muscles is always of benefit within the rehabilitation programme – although the time and amplitude in which the peroneal muscles fire under static conditions may not reflect what occurs during an actual injury. The capacity of muscles to produce force and afford stabilisation to a joint can be assessed by using static (isometric) or dynamic (isotonic or isokinetic) contractions. It is vital when devising a strength programme to understand the progressions of load and how speed influences the different forms of muscle action. A gradual progression of concentric.isometric.eccentric is a normal flow when trying to progress load on a tissue. The ability to change the force by applying various speeds during isotonic muscle action can influence the load going through the injured tissue and surrounding joints. In the early stages the athlete needs strength adaptation, without re-injuring the damaged tissue, with increasing force being applied through high-speed eccentric or low-speed concentric muscle actions in the later stages. Joints of the lower limb do not work in isolation. Consequently, dysfunction at one level has multiple effects throughout the kinetic chain, although the contribution of dynamic strength imbalances to chronic ankle instability is still controversial. Peroneal strength training has shown great benefit, both functionally and mechanically, to the rehabilitation of injured ankles. Bonnin was the first to realise that the frequency of ankle sprains depended on muscular control. With the ever-increasing use of eccentric muscle action within rehabilitation programmes, it is not surprising that eccentric peroneal strength is advocated. The use of this type of muscle training can be seen to have a decelerating effect on the mechanism of inversion ankle sprains. However, lentell and colleagues tested concentric and isometric strength in the invertors⁄evertors of the ankle but did not find peroneal weakness in previously injured ankle groups. Bernier and colleagues assessed eccentric ankle inversion⁄eversion strength and found no difference between patients’ healthy and injured ankles. McKnight and Armstrong looked at using concentric⁄eccentric strength measurements as criteria to returning an injured ankle back to play. They found no differences in testing injured compared with non-injured ankles and concluded that other factors should be used to determine the athlete’s return to play. Other studies have considered the relationship of agonist versus antagonist. Most of these studies have tended to evaluate the ratios on already injured ankles, and thus a pre-existing strength loss can have a detrimental effect on the ratio. Clearly more normative data on a large healthy population are needed before muscle imbalances can be used to maximum potential within a rehabilitation programme. Using isokinetic dynamometry to measure strength deficits does have drawbacks. The use of a rehabilitation tool within the research setting is difficult, as so many variables exist with the apparatus. Reproducibility and validity of strap tightness, verbal commands and axis positioning have all been shown to have an effect on measurement outcomes. Although isokinetic dynamometry is a good tool for gaining strength, especially eccentric, the speed needed to produce muscle reaction is limited on this piece of apparatus. Generally the strength speed used in testing is 30 second. This is relevant when the neuromuscular reaction time needed to prevent ankle inversion injury is 440 second. Further use of isokinetics in the research setting of ankle injuries is needed, and more standardised data using large healthy non-injured groups need to be collected. A set methodology is required across the scientific community, including speeds, ratios, similar values and language, which will make comparisons across studies easier and more applicable than is currently possible. of testing, but clearly more studies and comparisons between non-injured and injured ankles need to be undertaken to improve our understanding of the muscle firing sequence and speed in order to allow this to be applied in the rehabilitation setting. Reaction times and firing patterns play a key part in the later stages of rehabilitation, but no quantifiable information is currently available to assist the therapist in evaluating areas such as quantity, specific muscle groups and rest times between exercises. Lateral ligament injuries to the ankle can be a problematic issue to both the therapist and the athlete. There is a high rate of reinjury following this common sporting injury, and suggestions by Dvorak and colleagues and Inklarr give the two key risk factors as inadequate rehabilitation and incomplete healing. Studies have shown that a preventative programme incorporating the principles of strength and proprioception can reduce the rate of re-occurrence of injury to the lateral structures of the ankle. A planned programme must be designed around the athlete, the injury, and the type of sport that the athlete wishes to return to. An understanding of anatomy, proprioception and the principles behind the various methods of strength training needs to be applied in order to achieve a quick and effective programme. This article has considered somatosensory proprioception, although vestibular and visual proprioception also need to be applied to have the greatest effect. Physiological and accessory ranges of motion need to be gained before moving on to more testing functional activities. Strength gains and understanding of speed and its influence on load need to be planned carefully in order to achieve maximum results. The use of neuromuscular reaction must be applied in the later stages of the programme to develop the body’s preventative system from a conscious to an unconscious reaction. The demands and speed of any modern sport require these adaptations if re-occurrence of a lateral ankle injury is to be avoided.